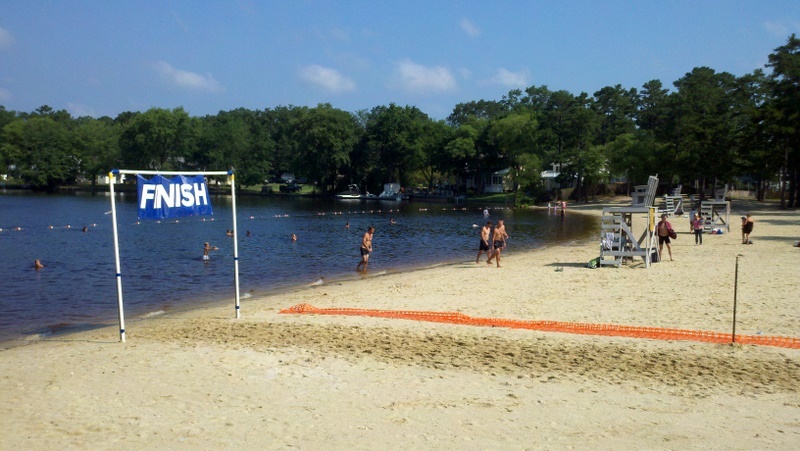 Last 4th of July, a week before the Lake Lenape 2010 triathlon, I had a horrible crash in LBI, NJ. Riding along in my aero bars, I lost control of my bike. My GPS showed that I was going about 22MPH at the time of the crash. Besides the horrible road rash on my back and cracking my knee on the street I was OK. My bike on the other hand didn't fare so well. It suffered a crack along the top tube, which made it completely unsafe to ride let alone race in a few days. I wrote Sean Clancy, the race director, to ask if he could push my registration to next year. He responded that he had a similar situation and was glad to help me out with rolling it to the following year. Fast forward a year later, I was able to move most of my parts over to carbon tri frame that I picked up somewhat cheap. 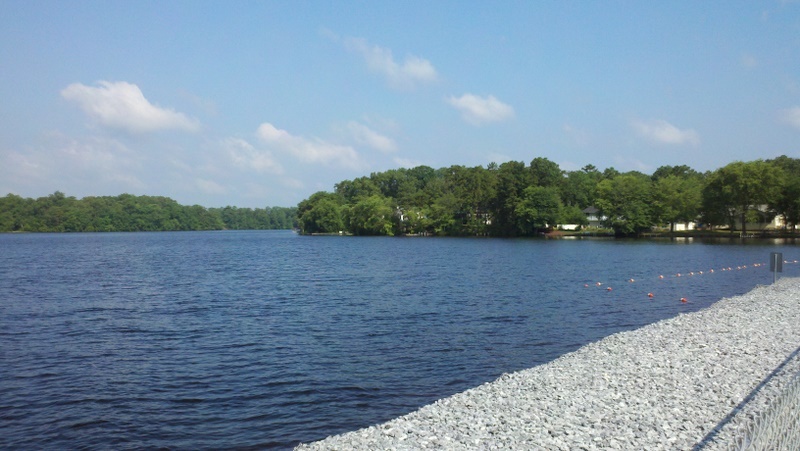 I was finally ready to tackle my 2nd sprint distance triathlon and lake Lenape was the perfect location. I got there eary to meet with the Sean so he could provide me with a race packet. True to his word, he provided me with everything I needed for the race. At this point I had about 2 hours to kill till the race started. Looking over the lake, I could see that it was a beautiful place to swim. With my staging area set I decided to take a run down to the water to warm up. The temperature was very warm, I believe it was in the 70s that day. Normal USAT regulations wouldn't have allowed wet suits, but seeing how this is a very popular race for first-timers they are allowed. The swim is my worst event, as much as I practice in the pool everything seems to go out the window when the race starts. I felt as though I did much better this time around, there was no repeat of 2 years ago. 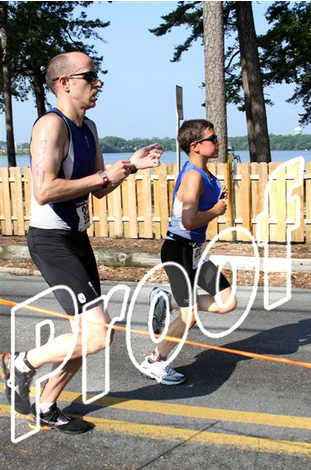 In the Philadelphia sprint triathlon I had to turn on my back to prevent myself from panicking. I completed the swim in 9:16, which is pretty slow. According to the results, I was the first person with the highest swim time. It just goes to show which event I need to be working on. 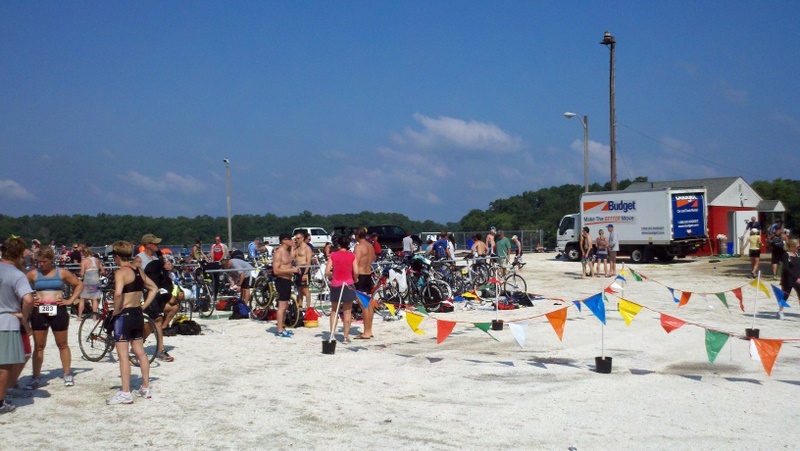 Once out of the water I made my way quickly to the transition area. I had some issues getting the wet suit over my ankle chip. It made me reconsider the whole idea of even wearing a wet suit. For me, the advantage is too great to pass it up. I'll gladly take the time penalty in knowing that I have the assistance of the wet suit. Once I got out on the road and on my bike I started to feel more comfortable. The bike course is built for speed, once you make your way down the street you head right to a straight, long out and back course. It's very fast and easy to maintain fairly high speeds since there are only 2-3 small hills. I was able to pass about 10-15 people on the bike section. The bike course felt as though it was over before it even started. Once I got back from the bike I grabbed my shoes and headed out for the run. Since running is the strongest of my 3 events I was excited to get to this section of the race. As I started to head out the staging area, I passed what looked like a 12 year old kid. I was shocked to see a few other younger kids that were competing in the race that day. I felt good on the run, I passed another 8-10 people and ran a fairly decent pace of 6:30 a mile. Not the 5:50 pace which I can normally run in a 5K. I finished in 26th place and 4th in age group. Not too bad for only my second sprint distance tri. This really is a perfect race for a first timers. Mostly because the swim is short, which seems to be the hardest event for most. They offer great support and the race location is perfect. The price was too steep this year for the Philly tri, and who would really wants to swim in the Schuylkill River?? If you live in the Philadelphia area I would highly recommend this race, I know I'll be showing up every year I can.